Chestnuts | Keep It Up, David! I didn’t eat my first chestnut until I was in my thirties. Is that shocking? I really have no idea. Some people enjoy chestnuts every Christmas – roasted over an open fire, as the recipe/carol says – but we didn’t do that in my family. I grew up having no concept of what a chestnut was, and thought, for a long time, that it was an old-timey, out-dated, possibly fictional seasonal food item, much like ‘figgy pudding’ and ‘sugar plums’ (neither of which I’ve seen in real life). For the past two Thanksgivings, when my family has congregated for turkey and football at my sister Sarah’s house in Colorado (where I’m going this weekend for the big race), we’ve gone to a local shopping center so Sarah’s kids can see Santa arrive. It’s a big to-do: they have actual real-life reindeer in a pen, carolers, and local restaurants passing out food. Either last year or two years ago, I saw a guy with a contraption that looked like a bingo ball tumbler set on fire. Turns out he was roasting chestnuts. I tried my first chestnut. I remember it being outrageously hot and burning my mouth – and not much else. It was an impulse buy – and an expensive one – 15 bucks! I’m so unfamiliar with chestnuts that it’s never occurred to me that I could actually purchase them, but then I saw them at the store, on a shelf near the olives and capers (and not, oddly, by the other nuts). 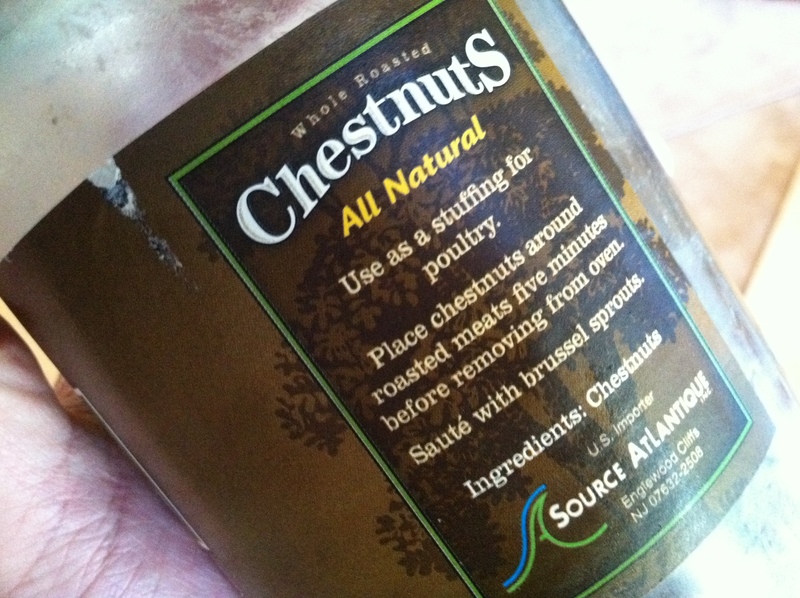 This blog has proven again and again that I like to try new things, so I suppose that’s why I came home with chestnuts. And since then, I’ve been dumbfounded by them. Their texture is completely different. These chestnuts are roasted, and while every other roasted nut on the planet is delightfully crunching, these are creamy, almost more like little potatoes than walnuts or pecans. While most nuts are full of protein, calories, and fat, chestnuts don’t have much of any of those things. 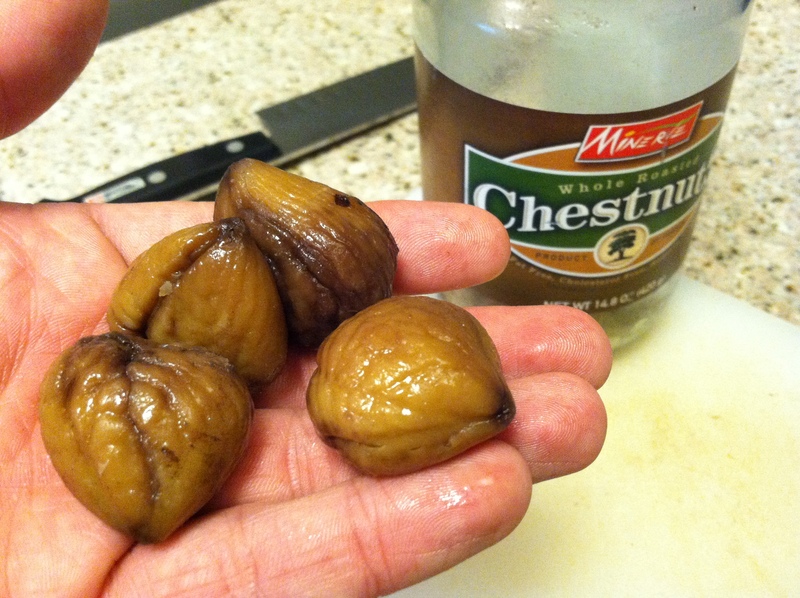 A serving of these chestnuts has 40 calories, no fat, and less than 1 gram of protein. They also don’t have sodium, which is unlike other roasted nuts, which are doused in tasty salt. They’re not sold in the nut section. Case closed. Maybe I’m wrong, and they’re as much a nut as any other nut (except peanuts, which are technically legumes). Or maybe I’m right. Maybe I’ll never know. Although if you can shed any light, please do so in the comments section! As a person living alone, I don’t really roast entire birds, so that idea will go untried, but what’s this? 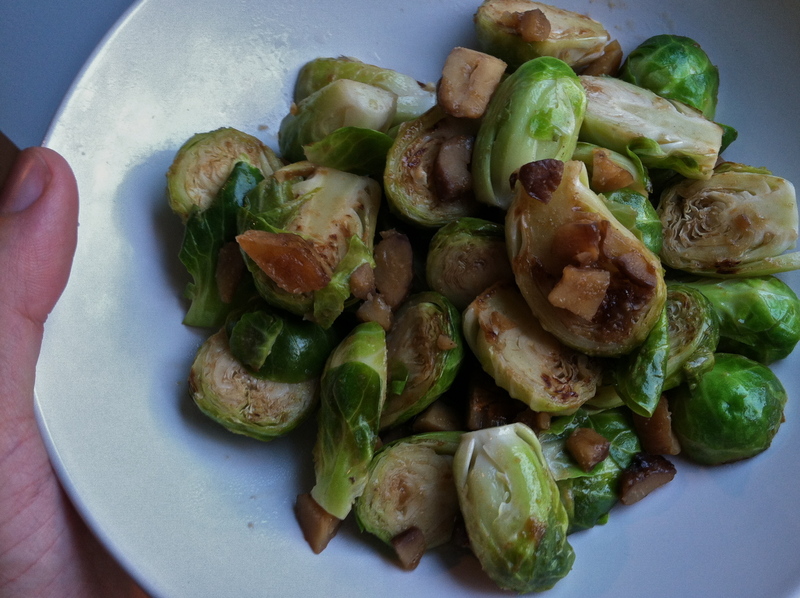 Saute with brussel sprouts? What a lovely idea! 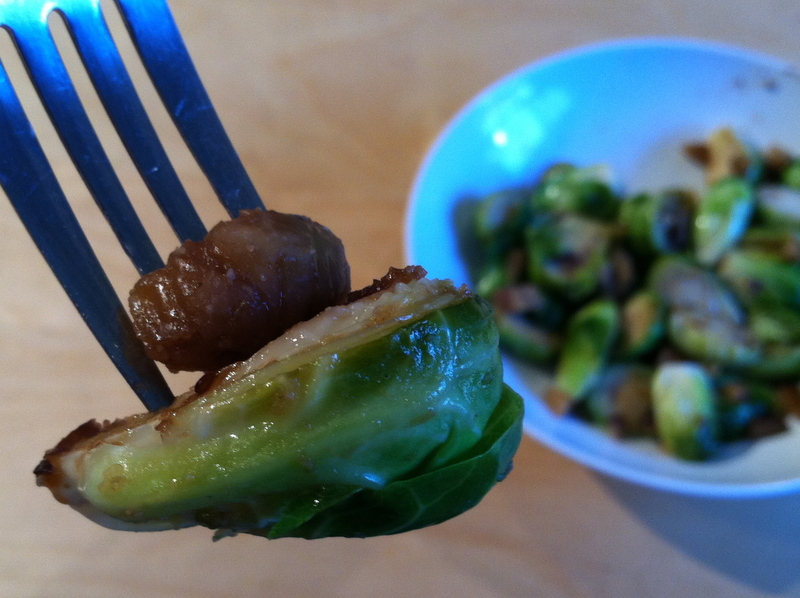 I adore brussel sprouts, and yesterday I happened to have some in my fridge! I gave them a rough chop, and then halved all my brussels. I sauteed them together, with some garlic and some low-fat balsamic vinaigrette. And it made for a delightful side dish! So who out there is a chestnut connoisseur? 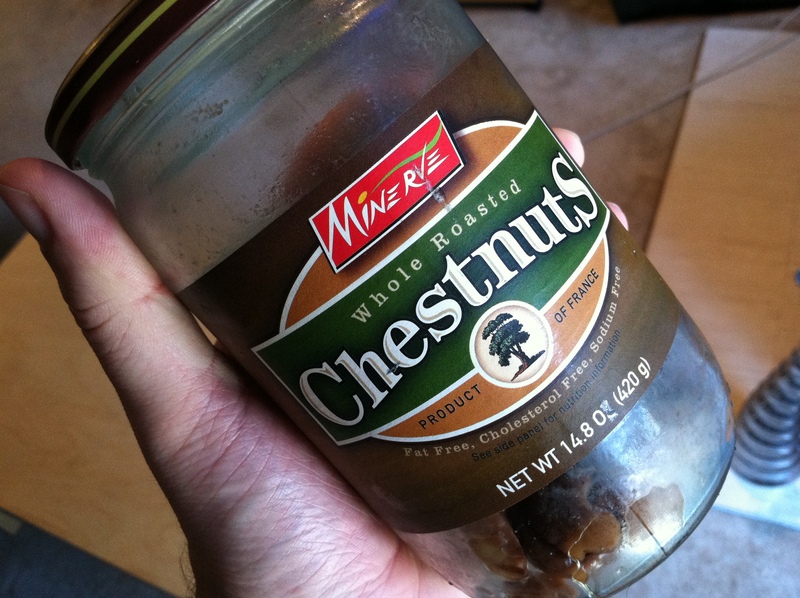 I still have chestnuts left in my chestnut jar… what shall I do with them? I want your healthy chestnut meal ideas! This entry was posted on Thursday, May 24th, 2012 at 12:26 am and is filed under Uncategorized. You can follow any responses to this entry through the RSS 2.0 feed. You can leave a response, or trackback from your own site. You know, I didn’t have my first mango til I was in my twenties. I always wonder if that was weird too. I have not really eaten many chestnuts either, but my favorite Food Network hottie Tyler Florence loves them. This recipe will require a little tweaking to get out most of the fat, but I think it’s easily changed (and I know you like to improve upon recipes). It would be great to make, freeze in single portions, and eat over time, or to take to a party.